The Olympus OM-D E-M10 wasn't the only good news from Olympus today. They also announced a handful of tantalizing accessories. Starting with the M.Zuiko Digital ED 14-42mm f/3.5-5.6 EZ Lens in black or silver for $349. This pancake zoom lens measures just .9 inches thick. It has a smooth electric zoom that is suitable for shooting movies, and can also be zoomed in and out remotely using compatible smartphones through the updated Olympus Image Share app. I'm also pleased that Olympus has improved the accessory grip for the E-M10 with the announcement of the ECG-1 for $59.95. They've designed a quick release lever that makes for simple removal of the accessory providing easy access to the battery. The 9mm f/8.0 Fisheye Body Cap Lens for $99 adds a functional twist to the standard camera body cap. The super wide angle coverage (140 degree field of view) is perfect for adding a little creativity to your photography. And finally, there's the new MCON-P02 Macro Converter ($64.95) that shortens the focusing distance for six lenses, including the 14-42mm f/3.5-5.6 EZ, 14-42 f/3.5-5.6 II R, 45mm f/1.8, 25mm f/1.8, 17mm f/1.8, and the 12mm f/2.0 lens. These accessories has a high Nimbleosity Rating. What does that mean? You can learn about Nimbleosity and more by visiting TheNimblePhotographer.com. "There are no secrets when it comes to light. Only physics," writes David Hobby in his free PDF titled, "Lighting 101." You can download this information-packed guide for free from his webiste, Strobist. This 63-page tutorial is full of invaluable tips such as, "To avoid refections in glasses, simply light from one side and have the person face the other. There is no need to be shooting all of the way in profile, either. A flattering, 3/4 angle (subject to camera) will work just fine." In my opinion, Lighting 101 should reside on every photographer's iPad for reference and practice. David Hobby had illuminated the path for working with flash for so many of us. Go visit his site today... and learn! It seems like it should work. 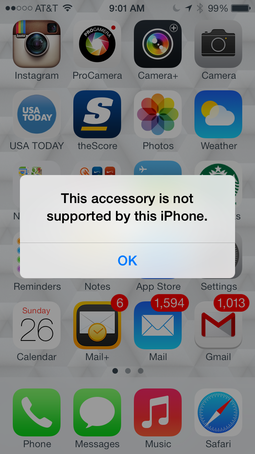 But if you plug the Lightning to SD Card Camera Reader into your iPhone, all you get is a not supported message. Ack! When I'm in super-nimble mode, I don't even want to bring my iPad (which of course does support the SD card reader). I just want a compact camera in one pocket and my iPhone in the other. This is where camera WiFi saves the day. No adapters required. Today, I'm heading out with a Canon PowerShot S110 that connects to my iPhone 5S wireless via the Canon CW iOS app. And boom! I can quickly move images from one device to the other. Personally, I would prefer it if Apple opened up the iPhone to use the SD Card Reader. It's always good to have a hardwire backup. Until then, thank goodness for camera WiFi. This tandem has a high Nimbleosity Rating. What does that mean? You can learn about Nimbleosity and more by visiting TheNimblePhotographer.com. A primary goal with camera gear transport is to prevent metal objects from colliding with one another. There are a variety of ways to do this. 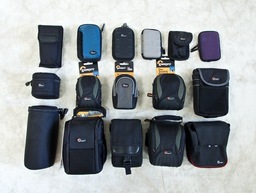 Many professional camera bags, such as those made by Lowepro, feature padded dividers to eliminate unwanted contact. This works great as long as your gear goes directly from the bag, to use, and back to the bag. That's not always the way I work, however. Often my camera bag is packed for traveling from one place to another, holding all of the equipment that I would need for that duration of the trip. Once I arrive at my destination, I most likely want to move about with fewer items, only selecting what I need for a particular shoot. I'll have a flat shoulder bag packed in my suitcase, such as the Lowepro Photo Sport 18L Shoulder Bag or the Walking Man Shoulder Bag, then use pouches to protect individual items. The Lowepro Photo Sport Shoulder Bag is a favorite of mine for travel. The system can be quite efficient because I stow much of my gear in pouches in the large camera bag. Then I simply pull the items that I want and relocate them to the new bag. Essentially, it's a modular system for your camera gear on location. Squarish shape that is more efficient when packed in a bag. Belt loop, and if possible, optional shoulder strap. This allows me to head out to dinner with just the pouch and no other bag at all. A variety of colors. This helps to quickly identify one pouch from another. The downside to this approach is that you can't get as much equipment in your "Point A to Point B" bag because of the pouches themselves. So I don't use this setup for every shoot. But for vacation travel and non-photography business, it works like a charm. This pouch system has a high Nimbleosity Rating. What does that mean? You can learn about Nimbleosity and more by visiting TheNimblePhotographer.com. Can the OM-D E-M1 Replace Your DSLR for Sports Photography? 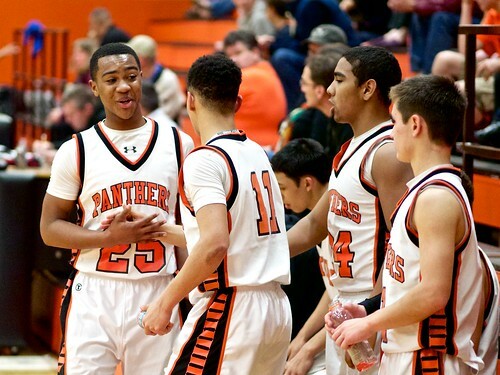 I've been covering high school basketball this season with the Olympus OM-D E-M1 and the Olympus 75mm f/1.8 lens. As people see my shots online, the question has come up: Could I use this tandem instead of a DSLR to cover indoor sports? The answer is a resounding, "depends." For example, here's a note that I recently received from Joel, who is a photographer in the TDS community. "I have had some issues with the 75mm Oly lens. I am shooting Dvision 1 college basketball in the best-lit arena in the Patriot League. I am able to use a combination of ISO settings starting at 1600 and going up thru 3200, simply dependent upon the aperture and shutter speed I desire. BUT, I am having some problems with focus slipping off my intended subject, or simply never locking in the first place. I don't have those issues with the 45mm lens." Joel went on to ask if I were having the same issues with the Olympus 75mm lens. My loss is higher with the 75mm than with the Canon 85mm f/1.8 on my 70D DSLR. So why do I keep shooting this season with the E-M1 and 75mm? The reason is because when I do get a shot I like, I love it. There's a certain feel that I get with the mirrorless kit that doesn't happen as often with other cameras and lenses. And as the season wears on, my percentage of good shots is rising. I'm having to learn how to shoot with this rig. This is why my initial answer to the E-M1 vs DSLR is "depends." If I were shooting a single assignment that required the highest number of good images, I would choose my Canon DSLR and lenses. My percentages are better. If, as the case for me this year, I have an entire season to build a collection of images for the high school yearbook, I'm sticking with the OM-D and 75mm. Last night's shoot, for example totaled 723 frames for the JV game. I liked 219 images from that game. I loved a dozen of those shots. 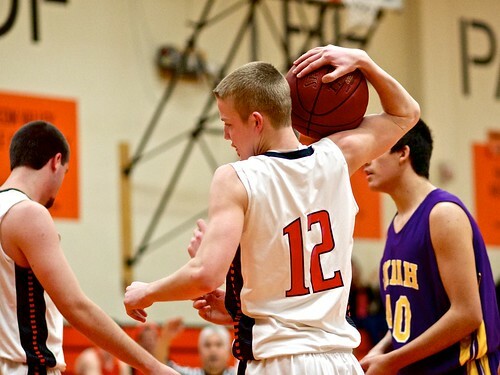 For those of you who shoot basketball regularly, how do those numbers compare to yours? My guess is that they are a bit lower. And if you were shooting these types of assignments to pay your bills, you should go with a rig that gives you the best percentages possible. You don't want to miss the game winning shot. As for me, I'm going to evaluate the body of work at the end of the season. Then I will decide. But for now, I'm going to stick with the E-M1 and 75mm and see how good I can get with them. So, what do people wear on their feet when attending monster trade shows such as CES in Las Vegas? This floor level view provides some insights. 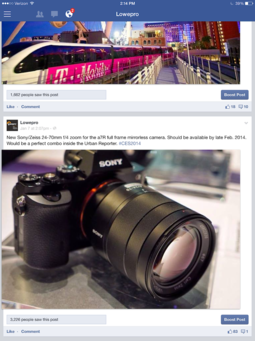 Recorded at CES 2014 at the Las Vegas Convention Center. I used a Canon S110 set at floor level. The movie was edited in Aperture 3.5 using the Slideshow tool. To learn more about Aperture, such as how to edit movies with this app, check out my Aperture 3.3 Essential Training (2012) on lynda.com. Also, take a look at our Aperture 3 Learning Center. Tons of free content about how to get the most out of Aperture. This week on The Digital Story photography podcast: New Mirrorless Cameras on the Horizon; From the Screening Room: Douglas Kirkland: Storytelling Through Photography - Nimbleosity Report - Mark Your Stuff - All of this and more on today's show with Derrick Story. Story #1 - New Mirrorless Cameras on the Horizon - the CES announcements were fun, but we still have more to come with mirrorless cameras in the coming weeks. 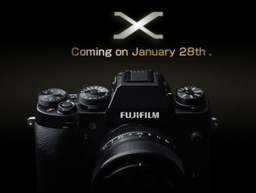 Leading off, Fujifilm is expected to announce a DSLR-styled camera on January 28. In the same timeframe, we're expecting new announcements from Olympus too. A few leaked images have appeared online, so it's best not to speculate too much at this point. It is safe to say, however, that mirrorless shooters will have new gear to tempt them. 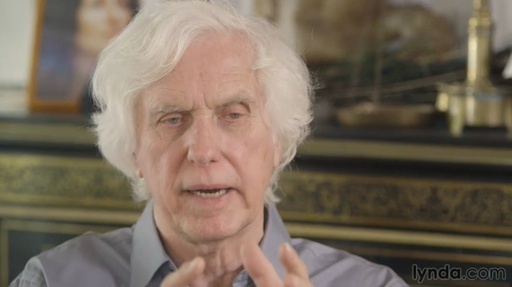 Story #2 - From the Screening Room - Douglas Kirkland: Storytelling through Photography. This week's featured artist is the iconic photographer who photographed Marilyn Monroe and Elizabeth Taylor. In this title on lynda.com, Douglas talks about storytelling through the use of his photography, and how every image should have a message. You can watch Douglas in action by visiting the TDS Screening Room at lynda.com/thedigitalstory. While you're there, you can start your 7 day free trial to watch all of movies with Douglas, plus every other title in the library (including over 20 by yours truly). Story #3 - The Nimbleosity Report - "Mark Your Stuff"
I know at first this might seem a little bit obvious, but I am surprised at how many photographers do not have their gear marked. There are a couple of approaches you can take, to ensure that you have a chance to recover your equipment, if misplaced. The Whole Bag Approach - for those who don't want to label every item, you can simply make sure that you have your contact information clearly visible somewhere in your camera bag. Label it All! - some photographers are more comfortable knowing that every piece of equipment they have as a label on it. If this is you, I don't think you necessarily need your name on every lens, but your cell phone number is probably a good idea. Serial Numbers Yes, Engraving No - cameras and lenses already have engraved serial numbers, so you don't have to engrave your name which depreciates their value. Instead, make sure that you have all of the serial numbers for your equipment on file. Built-in camera WiFi has evolved from novelty to useful. Two factors have improved this experience. First, cameras are able to establish their own hotspots and not depend on an existing WiFi networks. This provides much more flexibility. And second, companion apps that run on mobile devices now interact more smoothly with the cameras and provide a variety of functions. In my latest Macworld Magazine article, How to use Wi-Fi for an expert photo workflow, I detail the workflow I used to cover CES in Las Vegas, using the Olympus OM-D E-M1 and Canon 70D with their respective iOS apps running on an iPhone 5S and iPad mini with Retina Display. A few years ago, I would gather information and photos during the day, then go back to my hotel room at night to process and publish. Now, the expectation is to publish over the course of the day. Camera WiFi and improved mobile hardware and software make realtime reporting feasible. Show organizers and cellular providers also helped our cause by improving the networks at the Las Vegas Convention Center. As a result, I was able to shoot, edit, and publish at the event. If you find this stuff interesting, then take a look at How to use Wi-Fi for an expert photo workflow and see what you think. This workflow has a high Nimbleosity Rating. What does that mean? You can learn about Nimbleosity and more by visiting TheNimblePhotographer.com. 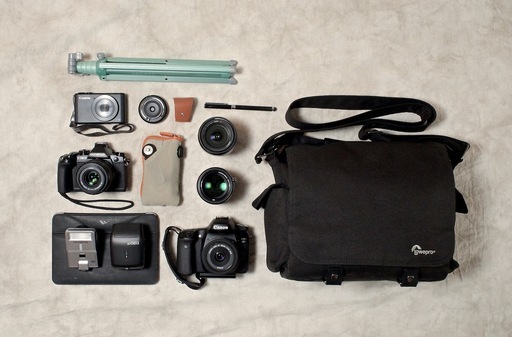 The folks over at In My Bag wanted to know what I wast packing in my Urban Reporter 150. So I laid it out for them, and added a new entry to the Nimble Photographer Fit Kit page. When I leave the house in the morning, this is the bag I grab on the way out the door. I have what I need for meetings, street shooting, Starbucks, and anywhere else I need to hang my hat to work.